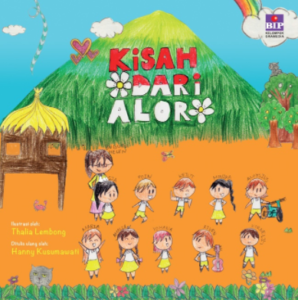 KISAH DARI ALOR (Stories from Alor) is a collection of stories for children, published by Bhuana Ilmu Populer, a Gramedia group, in 2016. I wrote the stories after facilitating a writing and reading session with the children of Alor back in 2015. Some of these stories are written based on the children’s experiences. I have always believed that we need more diverse books, especially children’s books. It’s important for children to see kids like themselves being the hero of their own story. Poin, Kornelis, Monika, and the other kids of Alor have their own hopes and dreams, fear and struggles. This is the story about understanding their cultural heritage, about welcoming changes and making friends, about being brave and standing up for what’s right. Living in a small island surrounded by beautiful forests and beaches, this is their story. JIKA is an omnibus of short stories published by Gagas Media in 2013. It’s a collection of stories and recollections related to “What-if” and “If-Only”, two of the saddest lines in the world. It’s a collaboration between myself and several other writers, including Alanda Kariza, Artasya Sudirman, Gita Romadhona, and Rahne Putri. There are 13 short stories written by 13 women in this anthology. Mine is entitled Tentang Kehilangan (On Losing). PEREMPUAN YANG MELUKIS WAJAH (The Lady who Paints Faces) is an omnibus of short stories published by Gramedia Pustaka Utama in 2012. It’s a collection of stories related to rain—a collaboration between myself and several other writers: Ndoro Kakung, Wisnu Nugroho, Ainun Chomsun, Fajar Nugros, Aan Mansyur, Karmin Winarta and Mumu Aloha. There are 11 short stories in this anthology, and there are three short stories of mine: Humsafar, Enam Jam (6 Hours) and Yang Tertinggal (The Left-Behind). Humsafar – Humsafar is an Urdu word with multiple meanings; from better-half to soul mate to traveling companion. The story revolves around two characters, Shah and Julia, as they are waiting for their flights in a busy airport. I am always interested in how a short exchange of looks or words can lead into something more meaningful, in how a stranger can leave such an impression that lasts for a lifetime. A short meeting between Shah and Julia in a crowded airport’s coffee shop envelopes the story of what will happen when you take the opportunity to connect and to say hello to a stranger. But don’t you think even our loved ones are strangers? Enam Jam (6 Hours) – Enam Jam is toying with the idea about regret. Not the kind of regret in a paralyzing sense, but more in an accepting way. You know how sometimes you ended up not getting the things that you want? It’s more or less about that kind of regret. The story spans in the period of 6 hours; when two souls, Bian and Nai, finally reunite after a few years, try to resolve some of the things from their past that have been left unspoken. But they have only 6 hours. And the clock is ticking. Yang Tertinggal (The Left-Behind) – Initially, Yang Tertinggal is a part of a bigger story. However, as I sat down to write a short story about rain, I just couldn’t get rid of it from my head. Hence, Yang Tertinggal became my third short story for the anthology. It’s a story told by Ella—who’s trying to find out her true feeling over Diaz, her ‘unofficial’ lover. The story tries to address questions such as: Do you love someone because you love him or because you’re so used to be with him? Do you love someone because you love him or because he completes you? Do you love someone because you’re crazy over him or because he’s the only one who’s available at a given time? Is it love or loneliness? Is it love or insecurity? Perempuan yang Melukis Wajah is now out in bookstores. It’s best to read these short stories when it’s pouring outside. A window-seat and a cup of hot coffee or chocolate are strongly recommended. #28HARI or 28DAYS started as a collaborative and experimental project between @ndorokakung (Wicaksono) and @beradadisini (Hanny Kusumawati) to write reciprocal prose and publicize it via two different Tumblr page: lelakiku.tumblr.com and perempuanku.tumblr.com. When they wrote this reciprocal prose, they agreed not to decide the flow of the story nor to agree on the story ending. The book has been published by Nulisbuku.com and is available to be ordered online from their site. Indonesian and English edition are wrapped into 1 book. Thanks to @evamuchtar for the beautiful English translation, and @nicowijaya for the wonderful gramophone picture on the cover. On February 1, a woman wrote a narrative and memories about her beloved. On the very same day, a man wrote a narrative and memories about his beloved. Their journals leave random footprints. Yet somehow they seem intertwined. Who are they? How are they connected? And what happens when their journals end exactly on February 14? The book gains its monthly popularity every February, close to Valentine’s day, as people are quoting some passages about love and relationships from the book, then share it on their social media accounts. bisa di hanny[at]raconteur[dot]co[dot]id, mbak. terima kasih.